Attribution is ascribing a work or remark to a particular person. With the popularity of pithy sayings on social media, it is tempting to quickly Google a list of quotes from a famous person, such as Gandhi, Nelson Mandela, Martin Luther King Jr. or even Jesus. However, these quickly “sourced” quotes are not always accurate. Here I have placed “sourced” in quotation marks to show sarcasm. Careful sourcing involves finding the original speech, book or other setting for the actual words being quoted. Google “sourcing” can involve a few clicks to find another person who says that a quote is accurate, even if the sources are not reputable or research-based. Simply noticing that many people attribute a particular phrase to a famous person doesn’t mean that person actually made the statement. Volume isn’t veracity in sourcing. There are several ways that sloppy attribution of quotes can go wrong: Either the person didn’t actually say what is being credited to them, or they might not have said it in the way that it is being used in the shortened version. While the internet can contribute to questionable attribution, it also makes the words of famous people accessible for research. I can actually listen to the “I Have A Dream” speech by Dr. Martin Luther King Jr. on August 28, 1963 to the people gathered for the March on Washington. Or I can read the text of Mahatma Gandhi’s “Quit India” speech from August 8, 1942. The third Monday in January is a national holiday in the United States, honoring the January birthday of Dr. Martin Luther King Jr. He was a civil rights leader who played a significant role in the fight for racial equality in the U.S. He was assassinated in 1968. As a preacher and a national leader, his writings and speeches are extensive. Quotes from Dr. King are indeed inspirational. But in the midst of sharing inspiration, accurate attributions are important. In 2019, on the holiday celebrating Dr. King, I saw two instances of a quotation that I was curious about. The idea sounded good, but I hadn’t seen it attributed to Dr. King before, so I decided to dig in a little and verify the accuracy of this attribution. The quote is: If you cannot do great things, do small things in a great way. When I first read the quote, I have to admit that it sounded a bit like Mother Teresa to me. But that was based just on style, not any research. A quick Google search revealed several instances attributing this quote to Dr. Martin Luther King Jr. (one in a speech by the President of an Ivy League University). But a number of attributions were to Napoleon Hill, a new name to me. So who actually said this first? In the 1928 book, The Law of Success in Sixteen Lessons, Napoleon Hill said, “If you cannot do great things yourself, remember that you may do small things in a great way.” I found the actual book online and saw this quote on page 113. It is possible that Dr. King quoted this phrase at some time during his many speeches and sermons. I did not do exhaustive research on all of his speeches and writing. Wikiquote is not a perfectly reliable source, however, it does catalog many specific quotes and their sources from books and speeches. Working backwards from Wikiquote, it is possible to find the actual source document for attribution. Searching the Wikiquote page for Dr. Martin Luther King Jr. did not reveal the “small things” quote. But Wikiquote is not exhaustive. Another good source of attributions is LibQuotes.com, whose motto is “Don’t quote it if you can’t source it.” In searching their site, they reference the “small things” quote as coming from Napoleon Hill. That’s how I found the name of Napoleon Hill’s book, and a few more clicks lead me to the actual text. Each quote on the website includes an “i” icon for more information and points to the original source. A writer or editor can then pursue the source document for verification. Perhaps this work seems tedious, but attribution matters. 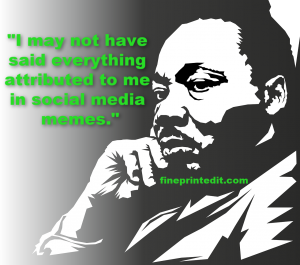 And since the famous historical figures have plenty of strong, well-sourced material to choose from, if you want an inspirational meme for social media, pick something that is traceable to a reliable source! Of course, beyond the issue of accuracy, there are a flurry of memes for particular holidays and events. In addition to considering the source for a quote, consider the context and your own voice. Are you pulling together a meme to join popular trends? Or is it core to your work and voice? But perhaps that’s another topic for a blog – to meme or not to meme? In my research for this article, I found some interesting sources and articles on attribution and quotations. LibQuotes.com is a great site for finding sourced quotes. Start here when you are seeking attribution, or even just inspiration. 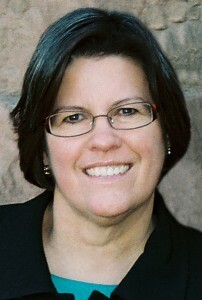 Carla Foote is an editor and writer who works for a variety of clients through Fine Print Editorial. This blog is used by permission and first appeared on www.fineprintedit.com. Carla edits Disciple!, a quarterly magazine for The Navigators ministry, in addition to other projects for The Navigators. She manages a blog and social media for an author, and edits books, podcasts and curriculum for a variety of clients. Previously, she was the executive editor and publishing manager for MOPS International (Mothers of Preschoolers), and was responsible for all operations of MomSense magazine and Connections magazine. Carla served as a trainer for MTI in Kenya in 2018 and in India in 2012 and is a member of MTI’s Board of Directors.